Three Iowa teens were arrested on Monday after they threw at least one Molotov cocktail at police. Two of the suspects were arrested after a three hour standoff. Three Davenport, Iowa teenagers were arrested early Monday morning following a 3 hour stand off with police. 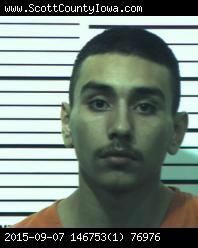 Just after 3 AM, Davenport police say Juan Pizano Jr., 18, of Davenport and two 16 year olds used a baseball bat to assault and rob a person on West Locust St. Shortly thereafter a police officer from nearby Saint Ambrose University spotted the suspects and gave chase. During the pursuit the 3 suspects tossed at least one molotov cocktail incendiary device at the St. Ambrose University patrol car causing some damage to the vehicle. All three suspects subsequently entered a residents in the 2100 block of Harrison St. one of whom surrendered to police almost immediately. After 3 hours of negotiations over a loud speaker the other two suspects surrendered without further incident.